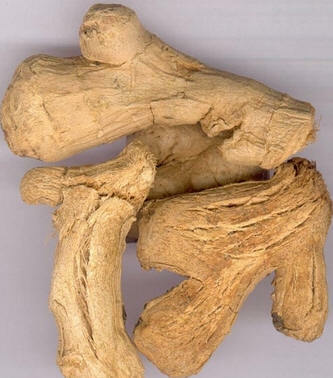 The processed dessicated rhizoma of perennial herbaceous plant Zingiber officinale Rosc. of family Zingiberaceae. Another name is Hei Jiang. Sichuan and Guizhou provinces in China. Fragrant in smell, pungent and spicy in taste. Firm, grey and yellow surface, grey and white inside with powder-like cross section, less fiber. Stir-bake Gan Jiang with hot sand until expanded, brown surface or stir-baked to charcoal till black surface and brown inside appearing. Bitter, astringent, warm; spleen and liver meridians entered. Warm meridians and stop bleeding, warm the middle and alleviate pain. This herb is bitter and astringent in flavor and warm in nature, entering spleen meridian. It can warm meridians, astringe and stop bleeding. Its indications include deficiency-cold of spleen and stomach, haematemesis and hematochezia due to the spleen failing to control the blood, and many other kinds of bleeding. It is used alone. For example, in Yao Shi Ji Yan Fang it is ground into powder and taken with rice soup for treating constant bloody dysentery. 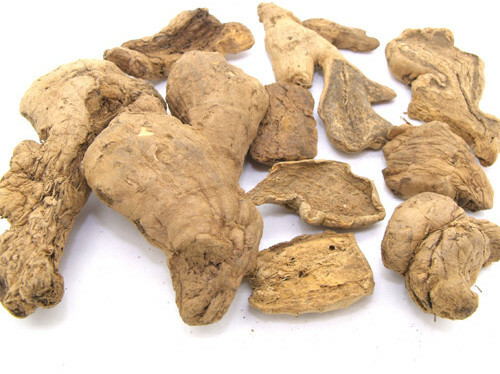 It is usually combined with herbs that can tonify qi and produce blood, and herbs that can warm interior and expel cold such as Ren Shen, Huang Qi and Fu Zi, etc. For deficiency cold of thoroughfare and conception vessels, and metrorrhagia and metrostaxis, it is combined with astringent hemostatics. For example, it is combined with Wu Mei and Zong Lv in Ru Sheng San from Zheng Zhi Zhun Sheng. This herb is warm in nature and good at warming the spleen and stomach, warming the interior, alleviating pain and checking diarrhea. It is indicated for abdominal pain and diarrhea due to middle energizer cold accumulation or deficiency cold of spleen and stomach. For abdominal and epigastric pain due to invasion of cold in spleen and stomach, it is usually combined with middle-warming and cold-dispelling herbs. For instance, it is combined with Gao Liang Jiang in Er Jiang Wan from Tai Ping Hui Min He Ji Ju Fang. For abdominal pain due to deficiency-cold and diarrhea, it is usually combined with middle-warming, spleen-warming and diarrhea-checking herbs.